This is a curious, clever use of the Short Trips half hour format to evoke the “stranger in our midst” feel of the UNIT era. The narrator is the Prime Minister, and the conceit of this story is that we finally find out what officials, or at least the PM, thought of UNIT’s controversial scientific advisor. He needs the Doctor because there’s been yet another alien problem. However, the Doctor is having one of his snits and can’t be bothered. If the mountain won’t come to Mohammad… you know the rest. So we have an unusual story with the PM of Great Britain (unnamed, of course) stuck learning what it’s like to be a companion of the Doctor. It’s a really great character study of the Third Doctor. The PM’s Balliol manner and stuffy elocutions gives this script a particular flair. I’m not surprised to find writer Jonathan Barnes has penned many of Big Finish’s Sherlock Holmes scripts. Also, there’s a fair amount of mystery in this story, not just that the Doctor is a stranger to the narrator, so that we’re seeing him from an outsider’s perspective, but also, we get a glimpse of how UNIT is viewed within the upper echelons of the government, allusions to incidents we’ve never heard about before, offscreen characters, a random gaydar ping, and a few other details not explained within the audio, leaving us to speculate. All of which extends the story outside of its 35 minutes. 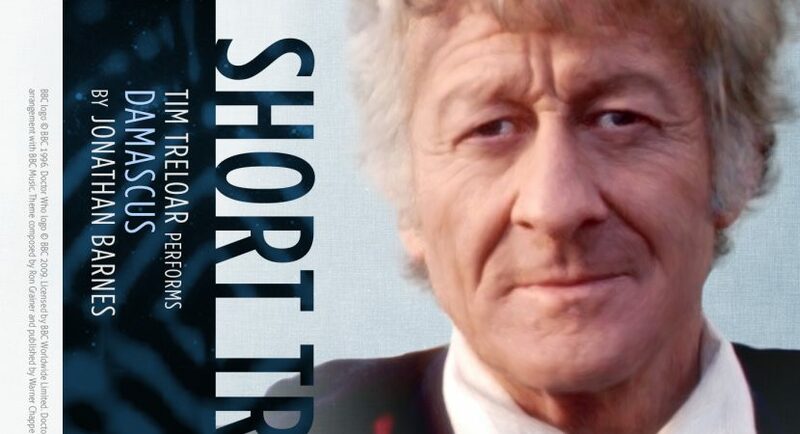 Tim Treloar is once again very convincing as Pertwee’s Doctor. My one quibble is that it takes ten minutes even to get to the Doctor, building him up but perhaps dwelling a little too long on guest characters (one of whom is fleshed out, then dropped as soon as the plot starts), and reducing Jo to a flash of blonde and blank, staring eyes. The ending is evocative and puzzling, suggesting a clash that’ll crop up down the road but which did not on TV and hasn’t, as far as I know, on the audios. The whole thing is very atmospheric, an interesting take on the UNIT era. The description of this audio on the Big Finish website wades into the UNIT Dating Controversy by setting it in the 70s, but I didn’t notice any such detail within the script itself. I was a little puzzled about “Project Damascus,” which we haven’t heard of anywhere else, and the choice to have the mysterious “young woman” offscreen the entire time. Also, where did that silver gadget the Doctor was working on in the beginning come from? Did she send it to him, or was that a random dropoff from the Time Lords to help him deal with this little problem? What was she berating the PM about— was the Damascus Project actually working on her Listnessness Device, which humans had stolen, or had they taken something else from her? Did she get off-planet? Why didn’t the PM actually act on his convictions that the Doctor had to be “stopped”? And who clicked off the recording at the end— the Doctor, or the PM’s successor? I felt like this story was a little unfocused on the actual story, but it’s mostly a meta piece exploring the Doctor and, to a certain extent, UNIT’s brief to cover up public knowledge of aliens. I love the idea that the PM is terrified of the Doctor.